Noel was the son of the artist Thomas Matthew Rooke (1842-1942) who was a designer for Burne-Jones and also worked for Ruskin. T.M. 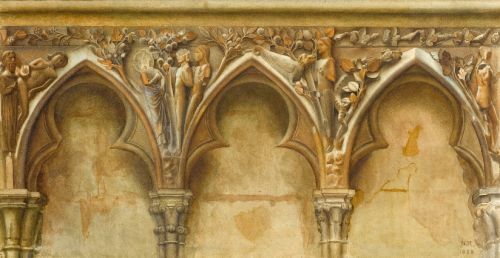 Rooke visited Bourges in 1899, one of the annual trips arranged by Sydney Cockerell, the idea being to produce a major watercolour to be presented to Birmingham City Art Gallery. The 1899 watercolour of the west front of Bourges Cathedral is still in the museum’s collection. He was evidently accompanied by his 18 year old son Noel who produced the present watercolour. Noel was educated at the Lyceé de Chartres before entering the Slade School of Art in 1899. A watercolour by Noel Rooke, of the same size, of the main portal of Senlis Cathedral, France, dated 1900, is in the Harvard Art Museum, Cambridge, Massachusetts. Noel was the son of the artist Thomas Matthew Rooke (1842-1942) who was a designer for Burne-Jones and also worked for Ruskin. Noel was educated at the Lyceé de Chartres before entering the Slade School of Art in 1899.